This site represents 18 months of on-the-fly learning and development by a director of a non-profit. Premium has been functionality and reacting to what the teen writers wanted. Have had considerable help from Drupal community along the way. 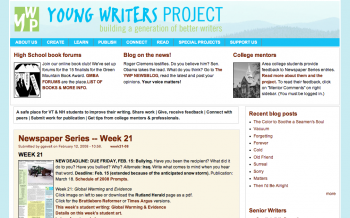 The site is designed to help us engage students to write, help them improve and help us publish their best work. What has happened in very short order is that these young writers have developed their own safe, respectful community. The energy is amazing. They’ve organized their own Winter Writing Conference, staged user presidential primaries and debates and, of course, established an energy and tone in which hundreds of kids comment on each other’s work each day. We have about 2,100 registered student users (we screen users to ensure safety) who have, since September 2007 submitted 2,500 pieces to our Newspaper Series (five daily newspaper partners publish best work each week); an additional 4,000 blog posts — poetry mostly; 17,000 comments. Other features: Other partners — radio stations, TV station, performing arts groups — also present student work; trained top college students serve as mentors and have provided feedback to about 1,100 young writers; students are reading and then reacting to RSS news feeds to the site in our newsblog and, most recently, audio stories which, of course, we call podcasts. Keep in mind we only serve Vermont and part of New Hampshire, which is a tiny area — a pool of about 60,000 students, but we are getting about 15,000 student visits a month. We have participation from about 225+ schools. Our basic design is simple — and does need work; it is a modification of a Roople Theme. Student users have provided and continue to provide us considerable feedback through several online surveys and the forums; they are particularly expressive in terms of functionality and features. So the site servers our mission well — Kids are writing; they’re having fun and they’re learning. Cool.